When John Lindsay was elected mayor of New York City, he inherited a city with serious problems. Manufacturing jobs, which had supported generations of previous immigrants, were disappearing, while hundreds of thousands of middle-class residents were fleeing to the suburbs. A former U.S. Congressman, Lindsay was hailed as the “Republican Kennedy” for his relative youth and liberal legislative record on civil rights, immigration, and urban issues. As mayor of New York from 1966 to 1973, he reached across racial and social lines during an era of division and discontent. During the “long hot summers” of the 1960s as other ghettoes burned, Lindsay would venture into downtrodden neighborhoods, walk the streets, and talk to ordinary citizens of the African-American and Hispanic communities. Thus New York City was spared most of the violent unrest that plagued major urban centers throughout the nation. During Lindsay’s tenure in office, Puerto Rican voting power began to express itself. Democrat Herman Badillo was elected as the first Hispanic Bronx borough president. 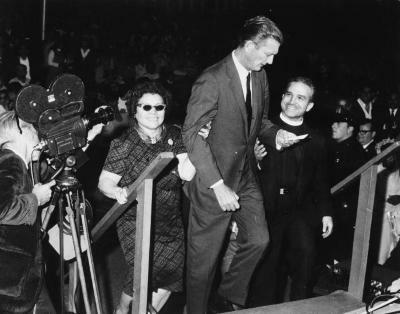 On the Republican side, Edward Mercado, a future director of the New York State Division of Civil Rights and of the federal anti-poverty program in Puerto Rico, participated in Lindsay’s 1965 mayoral campaign. The Puerto Rican community was expanding beyond Spanish Harlem, and a “Nuyorican” identity was being formed. Indeed, New York City had the largest population of Puerto Ricans outside of the island itself. Though a strong advocate for minorities and the poor, Lindsay’s spending policies were blamed for contributing to New York City’s financial crisis in the late 1970s. A series of strikes by transit and sanitation workers, teachers, and other public employees put a great strain on the city’s finances. While municipal unions gained large salary increases and pension benefits, the imposition of a city income tax and doubling of welfare payments sapped the city’s economy. Many blamed Lindsay for a soaring crime rate and a murder rate that tripled. Some felt that working-class white neighborhoods outside of Manhattan were threatened by a general deterioration of the quality of life. How do immigrants influence politics and culture? Describe the scene in the photograph and explain why the mayor of New York City would be attending a Puerto Rican festival. New York City Mayor John V. Lindsay attending a Puerto Rican Folklore Festival in Central Park, ca. 1966 or 1967.
Who is escorting the mayor? New York City was a hotbed of political activism and social strife during the 1960s and early 1970s. Use the Internet to find out about one of the following organizations, events, or issues. Explain why it was considered important and what effect it had on inter-ethnic relations in New York City. English Language Arts: Write a slogan for John Lindsay’s mayoral campaign. Art: Draw a political cartoon depicting events during John Lindsay’s term in office.